China Takes Over the World explores the myriad issues related to China’s growing economic, political and military power. While many in the West fear–and many in China hope–that China will dominate the world in the 21st century, this show seeks to highlight many of the current issues related to the rise of China’s global influence. The show’s inquiries are guided by the following questions: How is China seeking, strengthening and maintaining its global influence? How is the growth of Chinese power affecting the economic well-being and security positions of other countries? How is the world–especially the United States and China’s neighbors–reacting to China’s historic rise? How will China’s domestic economic and political liberalization, or the lack thereof, propel or hinder its rise? 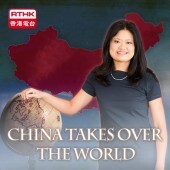 Hosted by Ying Ma, China Takes Over the World airs each Saturday morning at 8:30 a.m. on RTHK Radio 3, and features discussions with guests such as Chinese entrepreneurs, Western executives, well-respected academics, policymakers, journalists and experts from Asia, America and beyond. Follow Ying Ma on Twitter @gztoghetto, and follow the show on at https://www.facebook.com/Chinatakesover and on Twitter @RisingChina.